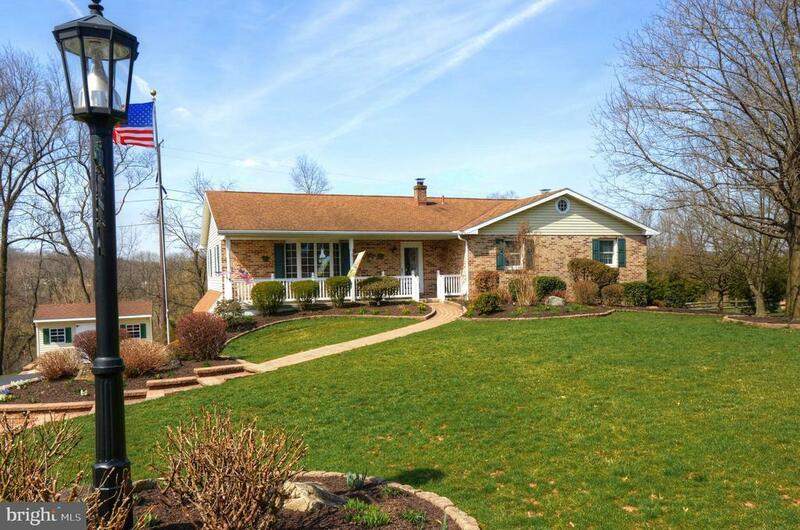 44 Walters Lane is a beautiful ranch home tucked away in a neighborhood situated on over half an acre in a cul de sac in Royersford. You will quickly notice the immense pride in ownership with this home. The outside has been meticulously maintained and well thought out from the front porch to the manicured landscaping. Enter the home into the foyer that has a large hall closet and leads into the living room. The expansive living room has a bay window and opens to the kitchen. The heart of this home is the amazing kitchen. Everyone loves to be in the kitchen and wait till you see just how many people it can hold! Large dining area with tile floor, granite counter tops, cabinets galore, tile back splash, bay window by the eat in area and built in pantry. There are stairs to a floored attic space as well. Just off the kitchen is the sunroom that overlooks the level backyard. Headed back inside we continue down the wide hallway. The hall bath has been updated with a tub shower combo. The 1st and 2nd bedrooms have two large closets. The master bedroom has a walk in closet and a private bathroom with stall shower. Just wait, there is so much more!! Walk downstairs and to a family room. Adorned with a brick gas fireplace this room is a great space for entertaining. The lower level sunroom adds even more finished space. Off the living area is a finished room with Laundry, office space, storage beyond your wildest dreams plus a full bathroom. Exit to the 2 car garage with more storage. The whole house generator is included in the sale. Dont miss the chance to view this beautiful home!